The current craze for mythical "teacup" pigs as pets will result in thousands of these animals ending up at overburdened sanctuaries, shelters and rescue groups when they outgrow their purported small size, according to Best Friends Animal Society. 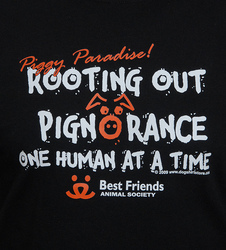 Best Friends Animal Society's "Pignorance" T-shirt. Yvonne McIntosh, an animal care manager for Best Friends who is an expert on potbellied pigs, says she was "horrified" when MSNBC, The Today Show, New York Post and other media ran cutesy stories about supposedly tiny pigs and gushed when Paris Hilton and Rupert Gint, of Harry Potter fame, recently adopted supposed micro pigs. "You can call them 'teacup,' 'mini,' 'micro,' or 'thimble,' but the truth is the supposedly tiny pigs do not exist," says McIntosh who manages Piggy Paradise at Best Friends Animal Sanctuary. "People who think they are buying a pig that stays small are being fooled. Unscrupulous breeders are breeding pigs less than a year old, and by the time the litter is born, the parents still are only about eight months old and far below their full size. McIntosh says it takes four to five years for pigs to reach full growth. "The breeders tell folks that the piglets will be no bigger than the parents, but the buyer doesn't realize the parent pigs are nowhere near full-grown themselves. Unfortunately, most people believe these breeders/sellers and do not educate themselves before they buy the pigs." McIntosh compares the small pig fad to a time when Los Angeles shelters were overwhelmed with small, purebred dogs that people bought so they could carry one in their purse, but eventually were abandoned in droves. When the novelty wears off, when the pig reaches 150 to 300 pounds instead of the 40 pounds it was supposed to be, or when people find out their local zoning doesn't allow pigs, there is no place for them to go and they become homeless. McIntosh has surveyed colleagues at pig sanctuaries and rescue organizations such as PigASus Sanctuary, Forgotten Angels Rescue & Education Center and Hamalot Pot Bellied Pig Rescue about their experiences with this trend. Some 300 full-to-capacity potbellied pig rescues throughout the country house approximately 300,000 potbellied pigs. And in the current economy, potbellied pig rescuers are also seeing increased requests to take in even more pigs. "One pig sanctuary owner received a call from a woman who wanted to dump the two potbellied pigs she's had for almost nine years so that she could buy 'teacup-sized' pigs," McIntosh says. Sadly, the lucky pigs may be the ones who end up in rescue. 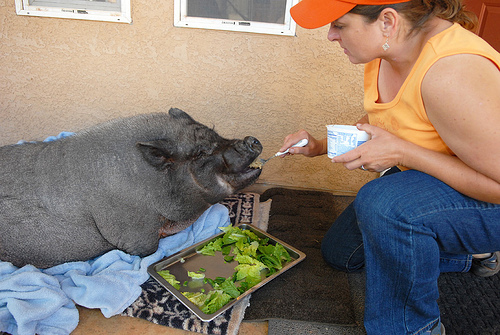 It is not uncommon for the pigs to be simply turned out as strays, even in cities. Many are taken to shelters and euthanized without any chance at adoption or placement. Other owners will kill the pigs or send them to auction where they can be bought for as little as $2 dollars and used to train fighting dogs or other similar fates. "A huge number of these little pigs also end up being stuck all alone in a small enclosure in a back corner of the yard, quite neglected once the novelty has worn off and the pig is fully grown," McIntosh said. "Because they are extremely social animals, this is a torturous life for them. There are thousands and thousands of 'miniature' pigs killed every year." And while the media-driven craze for toy-size pigs continues, it totally blots out the most important fact -- that pigs are wonderful companion animals. "At Best Friends our motto is rooting out 'pignorance' one human at a time," McIntosh adds. "There are scientific studies that show pigs are smarter than dogs. They can be trained to do tricks. They are easier to housebreak than dogs. 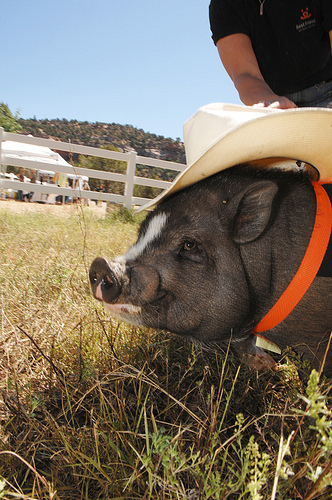 They are clean animals who love affection and give it back --on their pig terms of course. Socialized pigs actually crave human company. "Bringing a pig into your home is not quite the same as bringing home a dog or cat; pigs require specialized care and proper housing … that's why it is so important to fully educate yourself before getting one," McIntosh says. 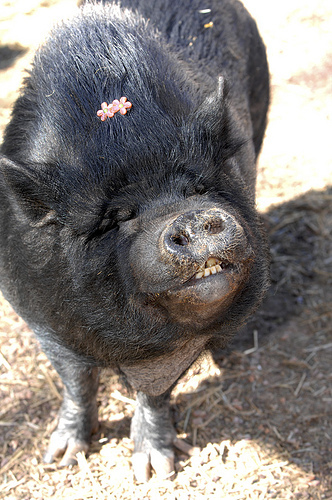 To learn more about the ever-engaging potbellied pigs, visit the Best Friends Pet Care Library's section, " You and Your Pig" and the Piggy Paradise community on the Best Friends Network. Best Friends Animal Society is a nonprofit, membership organization building no-kill programs and partnerships that will bring about a day when there are No More Homeless Pets®. The society's leading initiatives in animal care and community programs are coordinated from its Kanab, Utah, headquarters, the country's largest no-kill sanctuary. This work is made possible by the personal and financial support of a grassroots network of members and community partners across the nation. In 2009, Best Friends celebrates its 25th anniversary. Harley as 9 month old pig, around age used to breed "teacup" pigs. Now age 2, Harley weighs 150 lbs Full-grown Brittany is spoon-fed by Yvonne McIntosh, manager of Piggy Paradise at Best Friends Adoptable Raisin at Best Friends Animal Sanctuary is full of personallity & would make a great pet.